The event seeks to make both Hurtado’s life and his Catholic social thoughts more accessible to an English-speaker audience. Featured is the discussion of Hurtado’s Social Morality as translated and edited–for the first time in English–by Scott FitzGibbon, a professor at Boston College Law School, and Fernanda Soza, the Directora Ejecutiva of Plan Chile Massachusetts. More than 20 scholars will make presentations at the symposium. 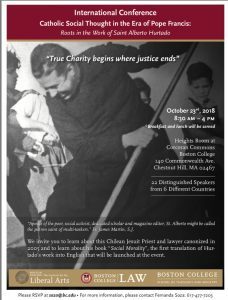 The event has been organized by the Institute of Liberal Arts, the Boston College Law School, and the Boston College School of Theology and Ministry.